This year, the Muslim New Year or it's celebration known as Hari Raya falls on the same consecutive days with the Indendence Day of Malaysia or Merdeka day. 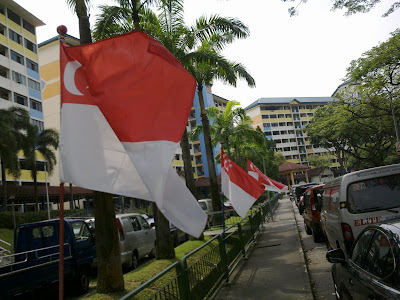 I am in Singapore during this time and coincidentally the country was having the elections for the President of Singapore on 27th August, just a few days before Hari Raya and Merdeka day. My mind is therefore filled with thoughts about the two countries of Malaysia and Singapore, their political, economical, financial and social development over the years. The ties between the two countries has always been close, as Singapore was once a part of Malaysia until its separation, where both countries continued to grow independently while maintaining a close and peaceful relationship. 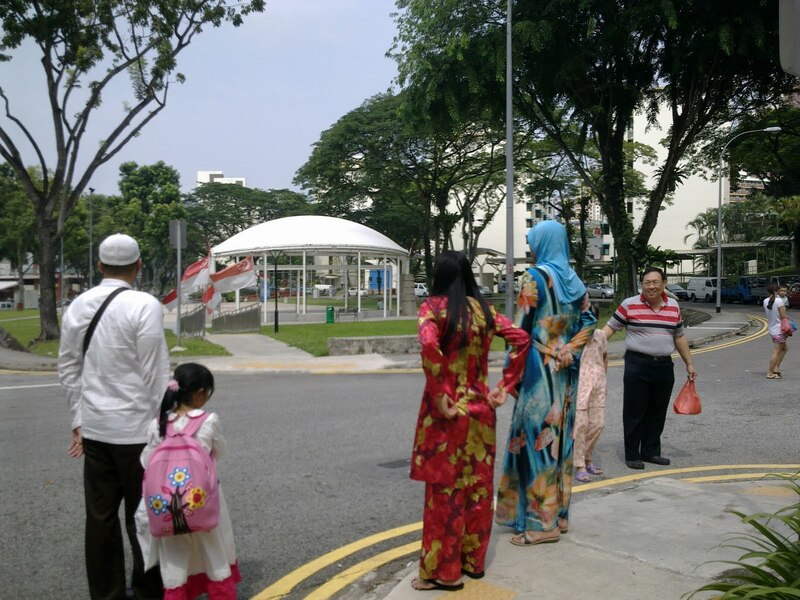 In our family, we have close ties to the two countries too as I married a Singaporean wife and though we started a family who have lived most part of our lives in Malaysia, we have been making frequent trips to Singapore all those years. You can call Malaysia as our incubator home to raise children in a "spacious greenhouse." As the children turned to teenagers, they began travelling to study or work overseas, particularly in USA and China. 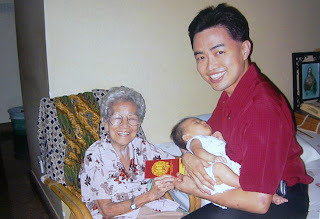 In the year 2007, the base of the family moved to Singapore itself and today it is appropriate for me to share my thoughts on both countries as I continue to shuttle between the two nations even more frequently than ever before besides my other international travels. As an introductory nutshell, I have concluded for some time that the small island of Singapore is a good metaphor that is symbolic of what the human mind can do if put in an Optimal state. Optimal Thinking from the mind that also was followed up with Optimal Performance of the body in implementing well thought of plans and systems is what I am referring to. In this case, it is the implementation of one man's Mind : his dreams, visions and principles which he believed in that led to the development of systems by the government that made the island what it is today. This is the mind of Mr Lee Kuan Yew, who had become the world's longest-serving Prime Minister when he voluntarily stepped down after serving for three decades in the republic nation island. See how sharp he is when he was young dealing with the Press in the USA about world issues. 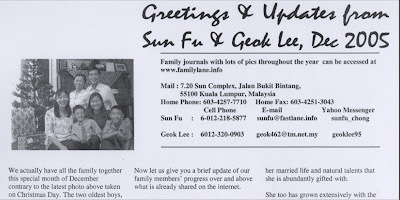 He shows a good rationale of why the American press is not suitable for Singapore. See him older at 87 years of age answering the press in Singapore about the Island's future. On life in Singapore interview with the locals. How good is a school in Singapore? A swimming complex in Singapore. Riding to the neighborhood market and food court. Driving on Orchard Road in Singapore. Christmas lights at night on Orchard Road. What's beneath Orchard Road in Singapore? Shocking discovery of a BBC video of classified British War secrets from World War 2 released only 70 years later that involved the fall of Singapore and Malaya to the Japanese by an unprosecuted betrayer from England itself! Under the 'Ang Mo' we all live happily together, no complain. Malaysia & Singapore is one big family in our brains. One day we both like two durians cannot get along. One moment like brothers, can give and take. Next moment we kena kicked out by the leg. We all also feel very very sad. Our neigbours all say, 'Wah they all sure to die! So 'Boh Pian,' we all work day and night. We also join the army so that we can fight. We don't care others 'see us no up'. But actually inside we very pain in the heart. Then slowly hor we grow rich and a bit fat. Now others talk about us also got some respect. They scratch their heads and say 'Very funny! Last time also got no money to buy ice-cream cone. Nowadays even small kids can also afford handphone. Seaport, airport also can become Number One. He! He! Sometimes think about it also very fun. But some people look at us also not happy. Actually they jealous don't want to say only. So every time their country got something wrong. They all say Singapore's behind it all along. Everybody know we water no enough. They turn off tap only we all cannot last. Aiyoh! They all think the water is one big ketupat. Wah liao, they think we small can makan! But now they 'cow pay cow bu' we all not very scared. We want to build water desalination plant already so not so bad. But their own economy now all go bust. Got to sell water otherwise money no enough. Got so much money, a bit more also donno how to lend. Like the center of a big dartboard. That's why they suka suka anyhow talk like that. But we all still send them a lot of rice. Show the world we actually very very nice. Sometimes we 'Cho Ho Sim' also kena whack. But we all gentleman wan, don't want to fight back. I think hor maybe they don't understand us very well. Size small small but still very very hot. 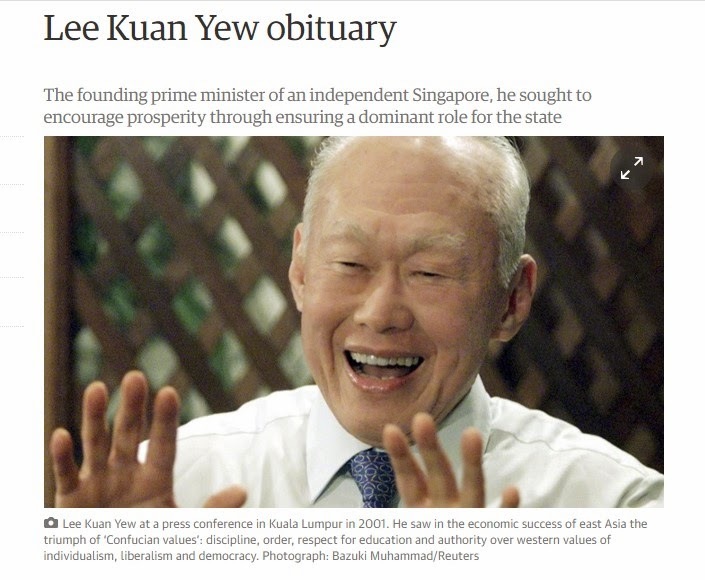 To read the obituary of Lee Kuan Yew by The Guardian, click here. Life of Lee Kuan Yew by wikipedia. 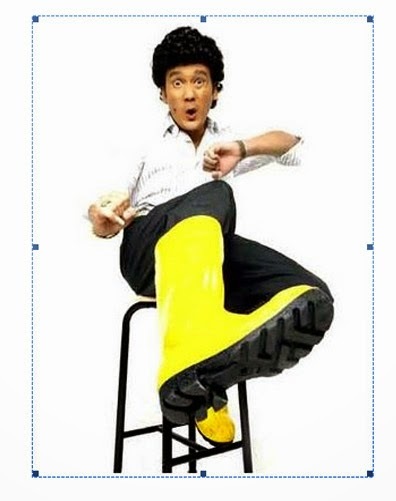 This post is best to be continued with an ending written outside of Singapore with my heart with the people of Singapore and their founder on his passing, who were all after all once Malaysians who showed they really can do it while in modern day Malaysia, the existing people are still saying they can do it with the "Malaysia Boleh" belief. Here is the summary post of Mr Lee Kuan Yew written while I am in another island of Penang in Malaysia. Former ambassador of Singapore to the United Nations, Kishore Mahbubani, Dean and Professor in the Practice of Public Policy at the National University of Singapore, speaking in Harvard University not long after the passing of Mr Lee Kuan Yew on China, US and the rise of Asia. She passed away peacefully on this day unknown to us as we were all in Singapore and I could not be reached by my Malaysian cell phone while using my Singapore phone! There were no messages in Facebook nor did I get any email either. It so happened that I was planning a trip to Kuantan the following weekend to call my brother that I was informed that she had just passed away the Friday before. We just missed her by a week and feel sad that our family will not be able to see her again in Kuantan as we have always done for so many years. "Eng Ee" as I would call her was not only my 3rd brother's mother-in-law but I have always known her as one of my mother's close friends when they were young in Penang. 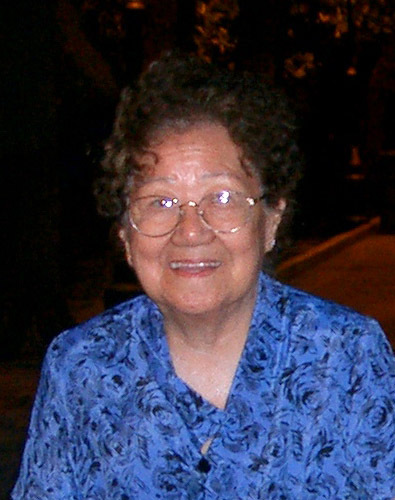 She outlived both my mother and father. She would have been 90 years old if I met her again this year as she always reminded me that her birth year was the same as my parents, ie. 1921. However I am sure she will tell me she is 91 years old, following the traditional Chinese way of calculation of age from the time of conception in the womb instead of the time of delivery! May God bless her with continued joy and happiness in his eternal arms is our sincere wish for her. It's been eight years since the Richards left Malaysia back in 2003. After moving to several more countries and locations, brother Richards finally retired in July, and brother and sister Richards have decided to settle down in West Jordan, Utah. On August 2, Karen got sealed to Roger and I got to attend their luncheon up in Clearfield, UT. After things started to settle back down again for the Richards, they invited Jay and me to have a Sunday dinner with them. Here's the evidence of our delightful evening with the Richards today. Tim is the last of the six children to leave the home. He starts his Freshman year at Utah State University next week. So starting next week, brother and sister Richards are officially empty-nesters. Shuan submitted an essay in July 2011 after attending a seminar of the "Science For Our Future" festival in Singapore. In that seminar itself, he won an iPod touch for submitting the best question to be answered by the panel of guest speakers. That occurred in a week of triple wins for the family in the month of July as recorded in the last journal post. After the seminar there was another competition for participants to submit an essay of no more than 300 words as to how the seminar had inspired the participants in their aspirations and how science would help them. A month later the results came out and Shuan became the winner of the free trip to Perth in Western Australia to take place at the year end in December. The trip is for one week visiting The University of Western Australia with other sight seeing trips. Shuan walking up to receive his award. On the right is Dr Joanne Castelli who is the senior administrative officer of The University of Western Australia. Shuan giving his speech and sharing the essay he wrote. Click the above screen to see the video clip or on this link if you don't see the screen. This accomplishment will also be added to our family blogpost that keeps track of the academic success of the boys in Singapore to date. Dec 2011, Shuan flew to Perth during the month and returned safely before Christmas. Account of his trip with photos is found in this journal post.